June | 2016 | SnailTrails.. . . . The first thing we hear on waking early on the farm is a cockerel greeting the dawn. Fair enough – it is a poultry farm. That makes two bird awakenings in a row – I like it. The cuckoo in Nonancourt was the better. We had a muddy pack up of electricity cables and used the water from the aquaroll to refill the tank. We would be arriving at the fermette in the afternoon so we were less fussy than typically about packing up – apart from wiping the mud off things. I can see it is quite a discipline if you are travelling for a length of time. A cheery wave good bye from the farmer’s wife – it was actually quite a nice stay and we would come back again in the dry. The route today takes us across country firstly to the amazing pimple on the landscape that is the famous white wine producing town of Sancerre, and then on familiar roads once more to the fermette. We’re on nice little yellow roads now. Neil has become a cruise control junkie while on the dual carriageways and is slow to relinquish the habit on roads with bends and towns and hills. I request some braking on long downhill slopes: cruise control does not apply the brakes, just stops applying the accelerator, so the van does gather pace as we descend! It’s easy to pick a destination and then just drive until you get there. It’s better to identify interesting or pleasant spots along the way to stop for a break. Why is it hard to stop once you are rolling? Force of habit telling you that it is only getting to the destination that matters? Sometimes that is true, but, doing what we are doing and driving only one or two hours a day, that is not so. We will still arrive in good time to get a pitch. There is a lake in a forest on our route so we turn off and park in the shade to eat cheese pasties and tomatoes. We pull into St Franchy and clearly there has been some rain here too. One possible plan had been to empty the barn and keep Portia in there between trips. Much carting of ten year’s junk from one outbuilding to another later and we measured up – oh no! The barn looks huge with its forty foot high beamed roof space: it is wide enough, the door is probably high enough but it is not long enough by about a foot:-( The doors have to be opened by pushing them inwards a bit to unlatch them before opening fully outwards, meaning we lose about a metre. Without the bike rack we would be just about OK. So that plan was abandoned and Portia would just have to pull up on the grass in front of the barn. It’s on a slight grassy slope. It had been very wet. Portia carved some nice muddy grooves in the grass and refused to get her front wheels off the road. It’s only a lane really and very narrow, but the farmer comes up twice a day in her tractor, or occasionally with some other large piece of farm machinery that lives in the barn at the end of the lane, so we have to leave it completely clear. Rolling back down the slope I park her on the flatter verge 20 metres down the road. We will just have to wait for the ground to dry out before we try again. The weather obliges, the sun starts shining, and a couple of days later all is well – Portia is parked in front of the barn and Neil is eating his lunch in the shade of the (slightly pruned) apple tree. supermarket bags-for-life are brilliant, they are big enough to bung things in easily. Don’t bother to buy specialist bags for packing things in tightly and neatly (like our bag that theoretically takes 25 metres of cable!). It is hard to readjust from the “two-week holiday” frame of mind. Take some time to look at the pleasing places along the way – enjoy all the journey. the best-laid schemes o’ mice an’ men gang aft agley*. Have a fallback plan in case your barn is the wrong size. **Oil painting of cockerel by our neighbour Evlin. Posted in Uncategorized on June 26, 2016 by rob1na. We had slept completely horizontally on a sloping pitch by finally breaking out the levellers. Easy! As I mentioned yesterday, we had nabbed the electricity for an hour and now refilled the water tank (100ltrs) plus an extra 40 in the aquaroll for good measure – still worried about running out of power and water! It was not raining so we took our time preparing to leave and chatted to the French neighbours on the other side who had arrived late, complete with Yorkshire terrier (good choice of dog!). Timing is important in social encounters – Dave was still around, having driven away to empty his grey water, and he strolled across to say hello. We were in the process of emptying the fully christened toilet down the black water point. It is hard to keep up polite chat while tipping blue poop down the drain. The whole process was pretty much a non-event though and, although all things toilet are apparently favourite topics for motorhomers, I will not mention it again unless something exceptional needs recording! For our third and final stop before arriving home-from-home in Burgundy I had found a France Passion site the other side of, and, in the circumstances, perilously close to, the Loire. Just south-east of Orleans it is a farm with horses, fishing, farm shop, evening meals by request etc – it sounded lovely. It was a much more interesting drive today as we had left the motorway trajectories and were onto smaller roads passing through towns and villages. Carefully. It was a bit tense when Stella opted in her usual cavalier fashion for the direct route straight through the centres of both Chartres and Orleans – neither is a large city though and it was not too unnerving. The proximity of the chosen farm to the Loire was worrying after all the flooding – we knew the road was open but the site may still be very soggy. Approaching the village the fields either side of the road looked very waterlogged with occasional puddles right across the carriageway. The farmyard itself looked even soggier. And more dilapidated than expected. Grey skies turned to rain and we ducked back inside to spend the rest of the afternoon watching TV. Strange combination of muddy french farm and Four in a Bed bitchery. Snatched another tiny walk round the pens of the many and varied breeds of poultry before finally being rained off to dine on the sauté of porc we bought yesterday. This is a good way to eat: €12 for an excellent plate of food for two. And we can feel we paid our dues to the town that was kind enough to host us for the night. 40 litres of water in an aquaroll weighs a ton and has to be lifted in where it threatens to overturn and break things with its weight. But doesn’t. The rain does not stop overnight:-( It is a nice cosy feeling to make a cup of tea three feet from your bed then climb back in with it while the rain patters on the skylight. But it does not encourage getting up and running around outside the van to carry out the filling/emptying/charging etc. The service point is in the coach park adjacent and would mean parking there for 55 minutes to charge up the battery. In fact the batteries look fine according to the figures on the solar panel display. We have enough water to last us a day or so and the next aire promises all the facilities, including one free electric point. If we get there first we can nab it! Not only is there a rumoured fuel shortage (which we have seen no sign of) but we are now hearing more on the news about flooding across many parts of northern France, including where we are going. We are definitely being tested by man and nature but, without detailed information, we decide to plough on as planned and play it by ear. In our satnav-free years we tangled unhappily many times with the extensive marshalling yards in Rouen. Often in the middle of the night. This time Stella plays a blinder and we sail through! (Not my own photo.) At one point Neil thinks he sees a flash in the side mirror and we may have been caught driving in a lane banned to vehicles our size for a couple of hundred yards. Not altogether obvious that is was restricted, nor clear why, but we got out of it promptly. Now hoping that the French road-fining system does not tie up with DVLA:-( For the rest of the 2-3 hour journey it is an easy, if not very interesting drive: despite having gone “toll free”, and expecting side roads, there seems to be a good network of free motorways in this area. We break it with a stop for bread and cheese in a motorway aire and somehow end up parked among the lorries rather than the cars: feel small as we sit at our table staring at the tops of huge wheel arches manoeuvering alongside. down a side lane to a green and leafy area near the Mairie adjacent to a meandering river. The pitches are a bit narrow and result in a slight difference of opinion about the giving and receiving of reversing instructions. Resolved! The one free electric socket has been nabbed by the one van already there – boo. But we filled with fresh water for free so can’t complain. There is no toilet at this aire so the time for unfettered use of the toilet has arrived! The friendly English couple (Pat and Dave) in the other van wander over for a chat. They are heading north and from them we learn about the seriousness of the flooding of the Loire further south around Orleans and discover the road we need to take tomorrow had been closed. There had been a very, very long queue of lorries going north outside Rouen. It seems all the bridges further south over the Loire were closed yesterday and they had all had to park up for the night further south – including our neighbours who had wild camped in a wood. The traffic jam seemed to indicate that the bridges were now open and the queue was the result of 24 hours-worth of lorries piling up against the tunnel under Rouen. Pat’s son lives just south of Orleans and she offered to find out the current position. No offer of a share of the electricity was forthcoming however, and we were too polite to ask. I guess we would have if we had been desperate but the drive down had charged up the batteries nicely. Nonancourt is lovely, historic small town with half timbered houses along a small river, traiteurs, boulangères and ramparts (we didn’t see the latter). Again, the weather, although not actually raining, did not encourage wandering around. We ate the totally delicious lasagne bought yesterday with a tomato salad and bread. Lasagne can be sliced and successfully reheated slowly in a frying pan with a heat diffuser. Microwave would have been easier but….not without 240v electricity:-( I had almost asked Pat for an hour of electricity when she came round with news from her son. But I chickened out. The news was good though – all bridges and roads now open. Well – the ones we were interested in anyway! We strolled briefly in the lovely landscaped park alongside the river behind the Mairie before the rain came then went to bed. What a privilege! a heat diffuser is a good idea. should we be more assertive about asking to share free resources? Early the next morning we nabbed the socket when Dave and Pat left. Ten minutes later the French camper next to us asked when our time was up, assuming we had paid. I explained it was free and we would hand it over in 45 minutes, a normal period of time for charging. He did not seem bothered and they left before we had finished. Felt a bit mean. the solar panel works a bit even in dull weather. agree reversing gestures and objective in advance. Don’t be touchy about taking an instruction. Be polite when issuing an instruction. To someone touchy. Posted in Uncategorized on June 14, 2016 by rob1na. I have commented before that Stella has a penchant for goat tracks. She must have resented my little joke and held a grudge ever since. Today she avenged herself by taking us down Ram Lane. Of the several narrow white roads marked on the map that went off in the rightish sort of direction she chose this particular one. No! 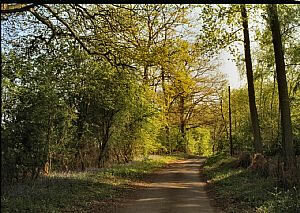 A narrow, gravelly, single track road with high hedges and overhanging trees. Should we back out onto the slightly less narrow road on a bend behind? Or assume that it would improve? We proceeded and the road deteriorated. Pot holes, grass down the middle, broken surfaces and puddles of unknown depth. Hedges left leaves wedged in the hinges on both sides, branches scraped the roof! Fortunately no on-coming vehicles. But – enough of that mini drama – we have learned our lesson about optimism and tiny lanes! After a very tense and very slow mile or two Ram Lane turned onto a real road. Finally, optimism is justified as we arrive at the aire in Montreuil to find eight beautifully laid out pitches, with a nice view, only two minutes walk from the town centre. In the coach park adjacent is a frighteningly automatic toilet (free) and a service point for water and electricity for a small fee. What a privilege! We could not be happier:-) Thank you people of Montreuil! We are the third to arrive and it fills up later. We arrive just after closed o’clock (2:15) and go food shopping. We know Montreuil from camping trips when were young and flexible. It is historically significant for many things but most recently as the British Army Headquarters under General Haig in the First World War. Now it is an attractive, busy old town with butchers and bakers and traiteurs. Mmmm – a good chunk of the lasagne changes hands for a few coloured beads and shiny mirrors. We manage a little walk around the town and its medieval ramparts before impending rain sends us vanwards. Settling in for the stay we find Neil’s carefully researched wifi access devices work outside the UK – hurrah! The satellite still picks up the BBC – hurrah! We seem to run fine without electric hook up (but are miserly in our usage). Water and heating are running nicely on gas. All neighbours are staying quietly inside out of the rain. Resisting the newly acquired lasagne we eat last night’s deferred chilli but allow ourselves the fresh baguette – maybe we are beginning to get the hang of it. I pored over All the Aires and France Passion to plot our next destinations. France Passion is an organisation that lists places where self sufficient travellers may park overnight for free. These are farms, vineyards and other local producers of various things. I would like to find one of these if possible. remember the third dimension when approaching vegetation – width, length and height! Easy to forget the latter. Easy to lose a satellite dome! We didn’t as it happened. entering geo-coordinates is more complicated than it looks. Fortunately I know Montreuil is not on a small island some way off the coast of Norway and, see first point, I revert to navigating by postal address! There is a complicated mathematical formula to convert one standard geo-coordinate format to another. Life may be too short to fettle this. Don’t you just love standards? 1 June 2016 – Go! Lots of rushing about picking up random objects in the house, list ticking off, plant watering and we roll out of our street at 12:25 – only 25 minutes late. Rather than get up very early and get to an aire in France late we decided to stop overnight near Ashford for an earlyish tunnel crossing. I identified several Britstops that would be fine but we chickened out and booked at a small Caravan Club site in Puckley – twenty-odd miles away. Having finally sorted our own difficulties the French unions started a fuel blockade. No! Not this week, please! Decided to go anyway. I guess in future we might take a few days to get down there along the byways but this time we were desperate to get out of the country after all the obstacles. So we went on the motorways all the way (A1 for the most part). It’s a long slow drag if you have decided to stick to 50mph following Jay’s analysis, but at least Neil got to play with the newly discovered cruise control. It’s smooth – noticeably so for the passenger – no inadvertent speeding up, slowing down or gear changing. We arrived at Puckley after six hours which is not bad for such stately going and considering the worryingly narrow Kentish roads at the end. The close-to-level field we parked up in was in delightful spot with good facilities (but no shower). the satellite no longer worked! No! After much cursing and button pressing Neil moved the van two feet forward. It started working. Amazing! Nearby tree was so small it was hard to believe it could have been the problem but – apparently so. This was especially pleasing as …. the CD player in the cab had stopped working:-( It reads the disc and seems to play it but no sound comes out of the speakers – just one loud click. Without the satellite it would have meant we would only have had french radio channels and downloaded music on the iPad for music. And we have no speakers for the iPad. So this needs attention. we are still in the frame of mind where we can excuse indulgences by agreeing that we are new to all this and need a break until we really get the hang of it! We strayed from the path of abstemiousness instantly due to the proximity of a lovely local pub. Two steak baguettes and glasses of bitter were more tempting than the veggie chilli I had lovingly prepared the day before to take with us. we seem to use nearly half a tank of water a day including two very small showers. always look all around the van before you leave and then behind you at the pitch before you finally drive off. Portia offers the choice of single bunks or a huge double. We will use both configurations but did not want to take both double and single bedding. In the end we took two single duvets and two double sheets. We can use the double sheets folded over for single use and a single duvet each even when in a double bed. Simples! And it worked well. Maybe king size sheets would be better for the folding over part. To bed early, slept well, woke early. Spent some time on the household chores and drove off the pitch leaving only the step behind, briefly. Everything takes longer than we expect, probably because we don’t get the sequence right the first time. I am sure this will come with practice! Posted in Uncategorized on June 9, 2016 by rob1na. After mechanical problems too tedious to mention and the most appalling customer service from Lowdham’s in Huddersfield we had to make many rearrangements to get Portia serviced and MOTed in time to get away – the new target date became 1 June. This meant we had a couple of days and one clear weekend to try the van out and visit Neil’s daughter and partner before taking off. So there was only one thing for it – we would park on their capacious drive in Nottingham and refamiliarise ourselves with the van in a handy, secure place. This had another advantage: Erica and Tom have only just moved into their new house and do not yet have a spare bedroom furnished. So we can now claim to be the the ultimately considerate guests bringing not only our own bedding, but our own bedroom! the fridge did not want to light on gas! The very helpful people at Danums in Askern (where we eventually took Portia for the habitation service, having sworn that Lowdham’s would never lay hands on the van again) explained the foibles over the phone and it was OK.
flat not being flat again. Sleeping on a very slight slope is OK even with your head at the down end but not advised if you eat a big meal first. We do have levellers now but could not be bothered to get them out. cruise control! Neil has a new toy. the heating and hot water still worked. Erica and Tom have a really nice house and very good taste in interior decor. Erica and Tom have a downstairs toilet and shower just inside the front door! a man-cave seems to be a good thing. In a house that is. And we had a lovely weekend that included seeing Batman’s castle in Woolaton Park and opening belated Christmas and birthday presents – yes, we had all been too busy to meet up for some time! I forgot to take photographs:-( but have one, taken later, of the nice new bunny mugs being put to good use. And so back home to pack and prime the van, visit the dentist one last time (hopefully), make travel bookings after the dentist visit, generally sort the house out for the house sitters during our several weeks away. Posted in Uncategorized on June 8, 2016 by rob1na.